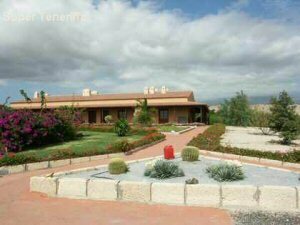 This selection of terraced villas have been converted from old farm buildings (which were used to store tomatoes and other farm produce) and they are situated near to Las Galletas in the sunny south of Tenerife. As the villas are single storey, they are very suitable for families and for wheel chair users. A beautiful garden surrounds the villas, as well as a pool and childrens' playground. The villas also have an internet facility. The garden consists of flower beds, fruit trees and cacti. Guests are welcome to pick some of the fruit if desired. 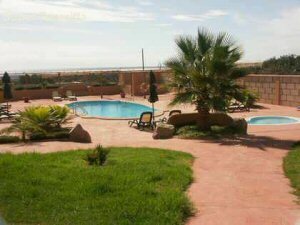 From the garden and pool guests may enjoy the spectacular view towards the sea and the port of Las Galletas. There is an ample supply of garden furniture and sun loungers available in the garden, as well as sun umbrellas. There is also a table tennis table here. The entire property is protected by a security gate, which has a remote control to open and close and there are shaded bays for parking cars. There are 6 villas altogether: 2 x two bedrooms, 2 x one bedrooms and 2 x studios. A cot and highchair is available in each villa, if required. There is a separate area where a washing machine and clothes dryer can be used by all guests. Each villa has satellite TV. All linen and towels are provided, but guests are requested to bring their own towels for use at the beach and pool. Restaurants and supermarkets are approximately 1km away and Las Galletas beach is approximately 2km. Despite this, we recommend car hire for this property.